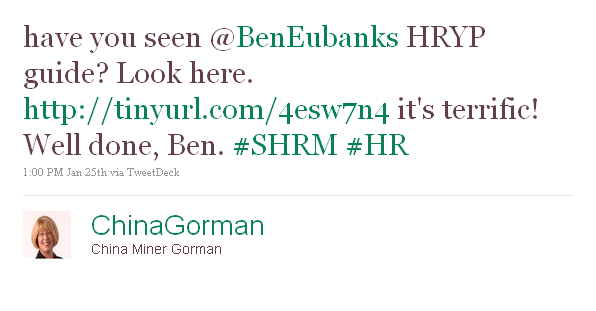 I\’ve been working as the chair for the SHRM YP (Young Professional) committee since August of 2010. Chuck Salvetti at SHRM put together a great team of people to work on connecting young professionals to chapters and to the SHRM organization as a whole. At this point we are working on a short guide for chapters to use as a tool for attracting and engaging the young professionals in their area. When I first started writing this blog, I wanted to help those people who were in my shoes. They were just getting started in the HR field. They knew that school didn\’t teach them enough to be successful. They were ready for an adventure. While my audience has shifted somewhat over time, I\’m always looking for ways to point back in that direction and offer something of value to someone in that situation. This guide is one of those ways for me to be true to my original vision for upstartHR. I hope it helps young pros to answer a few of the big, scary questions we all face. I hope it helps more experienced professionals to connect with the people who are looking to them for leadership. I hope it helps chapters see how they can serve young professionals by meeting their needs. I was overjoyed to see China Gorman, former COO of SHRM, endorse the guide the other day (see photo above). It really meant a lot to me and I can\’t wait to meet her at HRevolution. Click here to download or print the free young professional guide. 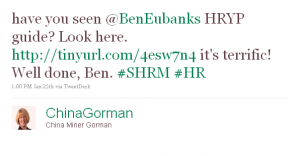 This entry was posted in General and tagged eBook, Free Resources, HRYP on January 26, 2011 by Ben. My spouse and I absolutely love your blog and find a lot of your post’s to be what precisely I’m looking for. Does one offer guest writers to write content in your case? I wouldn’t mind producing a post or elaborating on some of the subjects you write with regards to here. Again, awesome site!